Saharsa is situated on the bank of the famous river Koshi, which derived its name from the famous saint Kaushik. 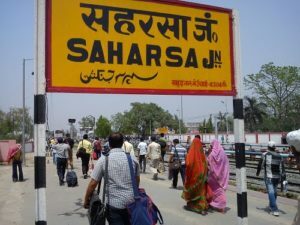 Saharsa was the homeland of the famous learned scholar Pandit Mandan Mishra with whom the great Adi Shankarcharya had come to debate, after travelling a great distance from the south of India. There are indication that around this time, the region was under the influence of Buddhism and Adi Shankaracharya had come to try to check its spread and stop the declination of Hinduism. The very birth place of Lord Buddha, Lumbini in Nepal is only 150-200 km north-east of this place. Due o the close proximity of the Himalayan Range, the climate of Saharsa is mostly pleasent throughout the year. You will find lush green fields, clear sky and pollution free air. In the summe, within a couple of days hot weather, there is bound to be a shower.